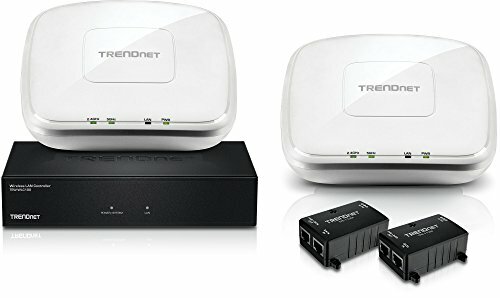 TRENDnet's AC1200 Dual Band Wireless Controller Kit, model TEW-821DAP2KAC, is designed to simplify management and setup processes for your access points. This new controller kit features seamless WiFi roaming, helping your devices stay connected when transitioning from one access point to another within the network. Fast BSS Transition, or fast roaming (802.11r) ensures optimal roaming conditions for your mobile WiFi clients. Airtime fairness provides higher priority to faster WiFi clients without limiting slower WiFi clients. TRENDnet’s controller kit includes two wireless AC1200 access points with PoE injectors, and a wireless controller. This kit allows you to easily setup and manage access points across your network from a centralized interface. Simultaneously manage up to 128 access points, perform batch firmware upgrades, and monitor network connection status. MANAGE ACCESS POINTS FROM ONE CENTRALIZED INTERFACE: This rack Mount designed Wireless Controller kit is your centralized AP Management system that allows you to easily set up and manage access points across your network from one centralized interface. MANAGE UP TO 128 ACCESS POINTS: Simultaneously manage up to 128 access points with seamless WiFi roaming, perform batch firmware upgrades, Monitor network connection status, Create a captive portal for hotspot applications, Client and SSID bandwidth management, Upload floor plans to create WAP Maps for a visual overview of each APÕs location. COMPATIBLE WITH AND SUPPORTS: IEEE802.11K Radio resource management, 802.11r Fast Roaming, Opportunistic Key Caching, Band Steering, Create up to 8 SSID's per band (16 Total), TEW-755AP, TEW-821DAP, TEW-825DAP and more. TRENDnet CONTROLLER KIT INCLUDES: One Wireless Controller with five gigabit ports, Two AC1200 Wireless Access Points (TEW-821DAP), Two PoE Injectors (TPE-113GI), Two 5 ft. Network Cables, Power Adapter, Controller Rack Mount Kit, and Access Point Mounting hardware.